When coming up with a title for this post I realized that I unfortunately already used “Busy” as the title for my immediately previous post – which is a shame because I’ve felt even more frantic in the days leading up to departure. I tried to see as many people as possible before I left and of course had to tie up a lot of loose ends. I was able to go out to San Francisco for 10 days which was great, though not nearly as relaxing as I thought. I said goodbye in person to my parents, my sister and brother-in-law (and their new dog), plus some friends from my high school days. I unfortunately missed some of you. I then had a series of going away parties/dinners/coffee meetups in DC, which were a little exhausting, but kept me busy during my unemployed days, and most importantly made me realize what great people I have in my life. My official job title is Small Business Advisor. I won’t know any specific duties until after training, but I’m likely to be involved in agricultural business. BF’s key crops are cotton, mangoes, and nuts. I’ve also seen volunteers be active in small side projects like making/selling homemade soap and bug repellent. In the meantime, I’ve been taking care of other Peace Corps requests such as applying for a visa/passport and providing an updated resume and writing an “aspiration statement” in which I wrote a few pages about how I’ll apply myself and how I’ll handle the working and living situations. While it sounds a little cheesy, it was great to be forced into sitting down and analyze how I’ll approach certain situations, like working with my future counterpart (a local who will help me to integrate into my assignment/community), and what I hope to get out of the experience both personally and professionally. I also had the good fortune of being put in touch with a friend of a friend who turns out is a RPCV who worked in BF from 2006-2009. He was great to talk to, and among other things, calmed my nerves about my two main concerns; language and the heat. He reassured me that the PC language training is the absolute best and that they transformed even new speakers into fluent speakers in only a matter of months. And while there isn’t anything anyone can do about the heat, he said that one does get used to it eventually, and to be sure to buy some linen-type clothing. I’m on it. Invite is in the mail! I woke up with one of the best emails I’ve ever received – my invitation is in the mail! I’m about 99% sure it’s for Burkina Faso leaving on October 13th, but won’t know until I get the invite in my hands. They sent it out yesterday (Friday) and since I live just five blocks from PC headquarters I’m hoping it might even come today, and Monday at the latest. I’m a little surprised everything happened so quickly as I’ve never actually spoken to anyone in the placement office for my entire application process – just 2 emails about my mortgage and French updates. So excited! This definitely changes things. As a follow up to my last post regarding my limited French, the placement office replied by saying I better get going on my French studies immediately. She proceeded to make sure I knew that learning two languages (French and whatever local language) at the same time is very difficult, especially when French is used in the classroom to teach the local language. I think learning one language is pretty difficult, so you better believe I’m firing up Rosetta Stone tonight! With that said, it’s pretty apparent that I’m being sent to a French speaking Sub-Saharan African country where the Peace Corps has a business program that is leaving somewhat soon. And guess what? 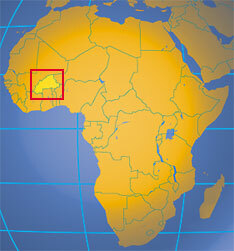 There’s only one option that I know of – Burkina Faso, scheduled to depart on October 13th! So it seems like it’s all set, I just have to wait for the official invite which hopefully will come any day now. And while I am incredibly excited, I don’t want to freak out quite yet. It feels pretty amazing to at least have something that seems fairly plausible though. Nine months after first obtaining my clearance and two eye surgeries later, I’m finally medically cleared again! I found out in a somewhat roundabout way. I received an email this morning from the placement office about obtaining documentation for how I plan to handle my mortgage while I’m away. I plan to rent my place out while I’m gone, but obviously won’t rent it out until I know when I’m leaving (I need somewhere to live too!) He said that was no problem and now that I’m medically cleared, my file will move on through the process. But if/when I accept my invitation there will be a hold on my file until I can find someone to rent my place and provide that documentation. I’m incredibly excited as now I could technically be getting a call any day now (though it could also be weeks/months of course). That call is with my placement officer, and is in essence a final interview.